We, a working film crew, designed a perfect ergonomic tool for serious Mobile Film Makers: a light-weight, flexible Mobile platform. Microphone… and the list goes on. No other product offers a kind of flexibility for Mobile Film Makers like the BlackWing. 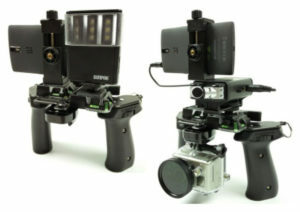 Got 4K Camcorder or DJI-Mobile-4K,1,2 Stabilizer?You can mount those as well in SECONDS! Take a look at a basic smart phone setup on the left, and more options on the same platform. You can change any accessories within seconds! FotoSafari Products donates 100% of their profit to support Mobile Film Festivals around the world, and to talented Film Makers who use their Mobile Phones.